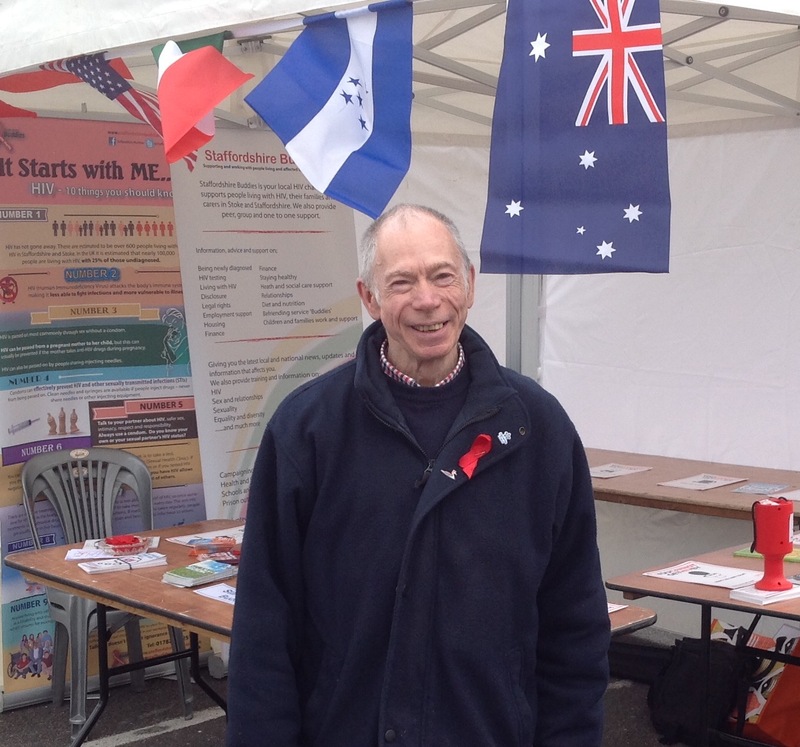 Undeterred by the cold, windy weather, I set up the Staffordshire Buddies’ stall on a corner of the carpark in front the Hartshill Medical Institute. I quickly came to the conclusion that I had come ill prepared for the wintery conditions…so walked back home to put on a sweater and find blue tack and heavy objects to stop leaflets blowing away. Others had shown less fortitude, as was clear from the large number of vacant stalls. However, the ones who had faced the elements proved to be most friendly and cooperative. The photo was taken by a person on the adjacent stall…and all the brave outside stall holders were treated to a plate of delicious Indian food from a Bangladesh stall. Next door to their stall was ‘languages for fun’ that had a jigsaw puzzle for people to complete by adding a piece…I was disappointed having worked at it for a quite a while …to leave the puzzle almost finished. But I graciously accepted…it was only fair other folk should have a go too! Inside the Medical Institute I saw many familiar faces and located the Nadin Theatre where I was to give a talk on International and local perspectives of HIV and AIDS. Once I knew where it was…I went upstairs to the cafe. There it was a great pleasure to catch up with people I hadn’t seen in ages…and to sit down with a nice cup of coffee out of the cold. Thankfully, I had warmed up by the time to deliver my brief talk. However, imagine my horror when I discovered that I hadn’t packed my carefully prepared notes. In fact, it turned out to be a blessing in disguise…because there was only a handful of people in the audience…so it made sense to talk directly to them. Not easy! Two of them were small children accompanied by their father…or may be it was the other way around. Certainly, these pair of youngsters had a major impact on what I said and the way I needed to phrase it so it would make sense to them. I guess I must have succeeded judging by the number of questions they asked and their astute observation of photos of my trips to New Zealand, Australia and South Africa. Of course, the presence in the shots of cuddly animals like koalas and wombats might have contributed to their keen attention. Barbara, who chaired the session, was also very appreciative of what I had to say…but then that’s her job! What could have been a disaster turned out to be a really enjoyable occasion…and has boosted my confidence to speak without a script; nevertheless… a whole day was devoted in preparation. I reckoned I was equipped to take the talk in many different directions…but never imagined it would be the one with which I was presented. 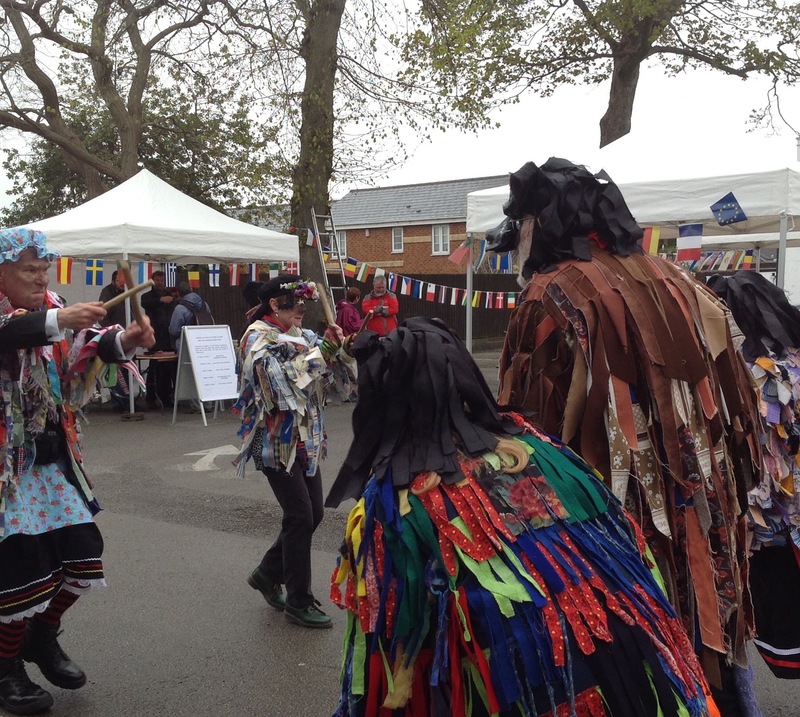 After the talk I went back outside and was impressed by African drumming, by performances of Kate and Greg with other members of the Boat Band and by the Black Dog Molly Morris Dancers. Great event…but when it started to rain…I decided it was time to pack up and go home.